Sunday was a beautiful day – nippy but with a clear blue sky so after breakfast, we decided to walk to the Recoleta, Buenos Aires’ infamous cemetery because this is where Evita Peron’s body is interred. The cemetery grounds are spread over 50,000 square meters and has 47,000 crypts. 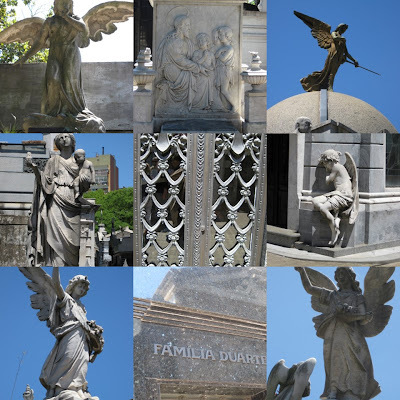 We explored the cemetery and admired the stone sculptures of angels and the elaborate crypts. We followed the crowds and soon ended up in front of the Duarte family mausoleum and peeped through the wrought iron grates. This is the most-visited crypt in the cemetery and it’s obvious from the tour groups hovering about and the fresh flowers laid at the front. We left the cemetery and admired the giant ombu tree in the park nearby and passed by the bustling cafe tables of La Biela. My good friend, Rumi, who I’ve known since our days in Chile arrived over the weekend from Lima for a short break. The last time we saw each other was in 2005 when she came to visit us in Montreal so it was good to get together and catch up on what each one had been up to in the last two years. After our walk around Recoleta, we had brunch at a little restaurant in an alley off Vicente Lopez street, Sirop Folie and toasted our friendship with Baron B brut nature then meandered back home.